Hi there, my darlings! I have one more post for you today! I think I have said a million times how much I love scrubs and masks--there's really nothing more relaxing than a mini spa day at home! It's the way I treat myself after a long week and today, I'd like to share a duo from Valentia--the Skin Detoxifying Clay Mask and Eternal Youth Exfoliating Scrub--that is perfect for one of these session! 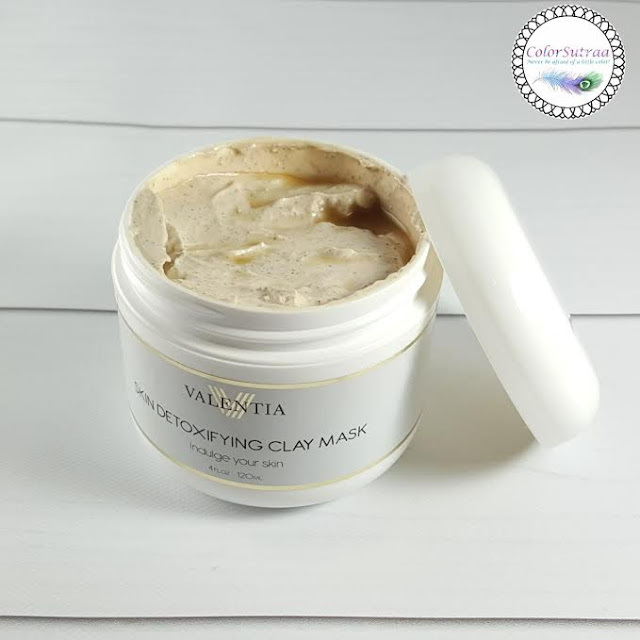 CLEANSES & EXFOLIATES: Kaolin Clay works in this mask to effectively draw out impurities caused by the environment, leaving skin clean, clear, and smooth. POWERFUL NATURAL INGREDIENTS: Hibiscus & Cranberry fibers, Spirulina and Astaxanthin have all been chosen exclusively for Valentia Detoxifying Clay Mask because they increase collagen production, anti-aging properties, reduce free radicals and restore skin elastic for a tighter and smoother appearance. YOUNG & HEALTHY GLOW: CoQ10 is a key ingredient that reduces the appearance of wrinkles by stimulating collagen productions to reduce free radicals that can cause premature signs of aging. Smoothes out an uneven skin tone with astaxanthin, which is known to restore skin's natural elasticity so your skin looks and feels healthy. REDUCE SIGNS OF AGING: One of the main ways in which free radicals damage skin and cause premature aging is by attacking the skin and leaving it weak and loose. 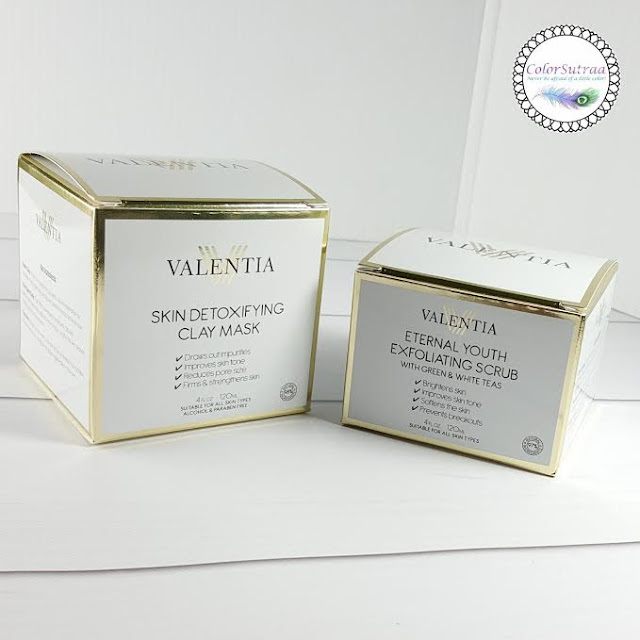 Valentia Detoxifying Clay Mask reverses that damage so the skin is firm and strong, leaving you looking stronger and healthier. 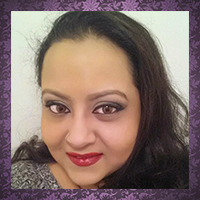 SPA AT HOME: Pamper your skin with an expensive spa treatment right at home. Apply the clay mask and leave on for less than 15-20 minutes, grab your warm water and towel and wash gently off. Get the same deep cleanse and skin exfoliation the spa offers for less money and in the comfort of your home. IMPRESSIONS : Right off the bat what I noticed that I loved is how GOOD both these products smell! The Scrub (pictured above) is deliciously scented with White and Green Teas and the Scrub (pictured below) smells fruity and tangy! If you have fragrance allergies, these may not be for you but for a girl like me, who prefers EVERYTHING scented, I'm in love! A good scrub is a blessing and I personally found this one mild enough to use several times a week. After each use, my skin feels softer yet firmer and just radiant--must be the anti-oxidant power of those teas!This is just a treat to use in the shower! I love the Clay Mask because it helps clean my pores, draws all that gunk right out of there and I feel like I'm doing something good for my skin and helping it not break out randomly. Since it is winter, and although, I didn't find it very drying, use sparingly--just once every couple of weeks and definitely moisturize afterwards. 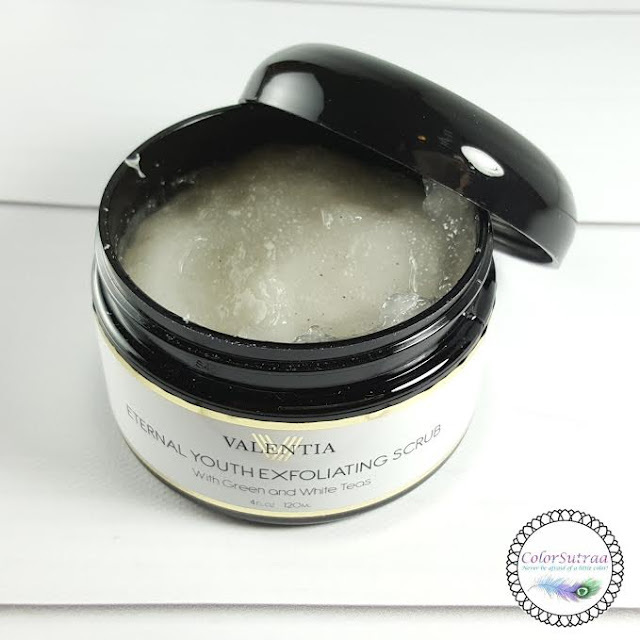 If you would like to try Valencia's Skin Detoxifying Clay Mask and Eternal Youth Exfoliating Scrub for yourself, you can find it ON AMAZON HERE for the price of $25.00 for the set--what a great deal! What is your favorite at-home spa product? I'd love to hear your opinions in the comments section below!